The apps on Setapp are already pretty impressive, but they never stop getting better. Just recently our time tracker Timing has rolled out a major upgrade and it's already available to all Setapp users. Timing is an app for time tracking that has finally solved all the troubles of its analogues. Specifically, the need to turn the tracking on and off manually. 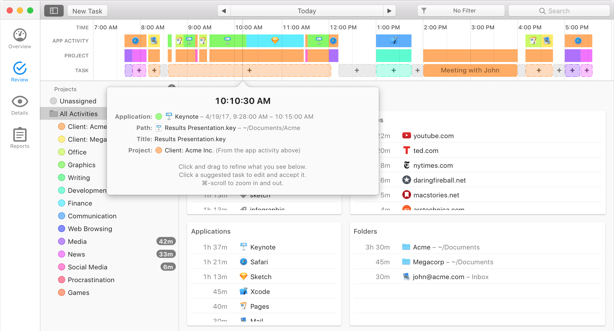 You don't need an app that requires a reminder to start tracking your work, you need an app that does it automatically, the moment you open your Mac. That is exactly what Timing does. Complete redesign. The interface now sports beautiful real-time animations and graphs, it's easy to navigate and easy to adjust to your needs. Under-the-hood update. The code has been almost completely rewritten, which means the new Timing works at light speed and shows you all the info instantly. It also offers Productivity Score to show you if you were productive recently and has a Dashboard to view all your projects and trackings at the same time. We'll keep you posted with more news on updates and also on the cool new apps we add all the time. Cheers!